I would appreciate any info on what products members use for washing the exterior of their painted RW. Also, has anyone heard of or used a dry cleaning product for the exterior? The RW owner who is at the park where we're staying told my husband that Walmart sells such a product and that they've used it with good results. I use Turtle wax car wash soap to wash. For Waxing I use a spay on 3M wax that easily wipes on and leaves a UV protective coat. Been using this combo for 3 years and looks as good as new. Are you sure it's a Dry Cleaning Solution, or did he mean one of several so called "Dry Wash" Products. They allow you to wash a car, truck, or RV without using water. That's what I was talking about, dry wash that allows you to wash with no water. Wasn't sure what to call it. We have the Set-up that they were selling at the Rally. It works OK, but once you get the Pole extended to reach the Top of the Front Cap, you can't put much pressure on the cleaning head. At least it allows you to get most of the bugs off the Front without violating the CG rules. Wash-Wax All is a real good product.. I use it on my RW in between washes ..Check out their stuff, no need for water and looks good when done. You can use whatever products you would use on your car/truck, the RWs are painted using automotive paint. I use Turtle Wax soap mixed 50/50 with McGuires soap, it doesn't remove the wax & leaves it nice & shiney. The BEST product I've found is the guy they recommend at the park office. Lol - I agree with Danny. I've found as I get older that the local recommended wash/wax service has a lot of merit. I've also found that they are much cheaper in a bigger city area as there are more of them and more competition. Last time we were at Lazy Days I got both coach waxed and truck detailed for $350. Found that pretty hard to pass up. Full hand wax on both. Can get same at Cherry Hill in College Park MD by D.C. The last wash I paid for was $80 ($2 per foot) last season where we workkamped & Roland Glover (fellow RW owner) & I got them washed/hand waxed a couple seasons ago in Yuma for $125 each & they did an awesome job. Danny.........send those folks to Indiana! I got a quote from Tiara RV 5 years ago at about $400. for wash and wax. 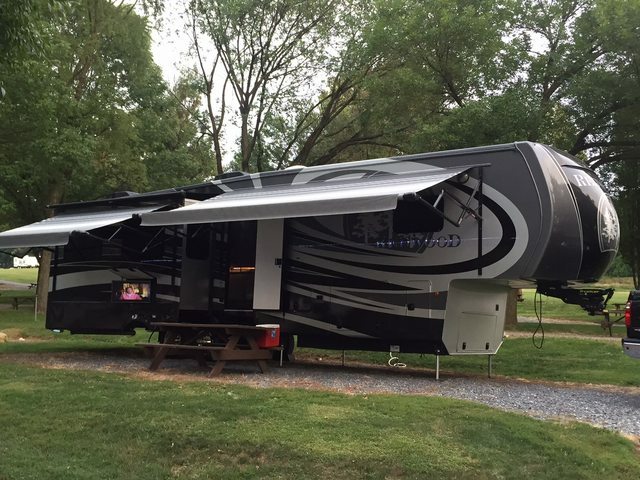 This summer, another mobile RV service quoted me $700. for wash and wax. Needless to say, I turned down both!! !